DM1 & DM2 Disposable Media Retaining Frames - Airsan Corp.
Airsan Type DM series of disposable media frames is designed to meet the need for a cost-effective frame without sacrificing durability. The frame itself is 18-gauge galvanized steel, while the discharge side is 18-gauge galvanized expanded metal for low pressure drop. The 11-gauge steel retaining ring is hinged for easy access to filter pads. Precision fitment of the face panels ensure there are no exposed ends, an often overlooked safety feature. AIRSAN TYPE DM SERIES OF DISPOSABLE MEDIA FRAMES IS DESIGNED TO MEET THE NEED FOR A COST-EFFECTIVE FRAME WITHOUT SACRIFICING DURABILITY. THE FRAME ITSELF IS 18-GAUGE GALVANIZED STEEL WHILE THE DISCHARGE SIDE IS 18-GAUGE GALVANIZED EXPANDED METAL FOR LOW PRESSURE DROP. THE 11-GAUGE STEEL RETAINING RING IS HINGED FOR EASY ACCESS TO FILTER PADS. 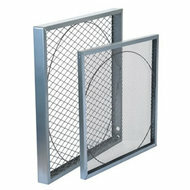 PRECISION FITMENT OF THE FACE PANELS ENSURE THERE ARE NO EXPOSED ENDS, AN OFTEN OVERLOOKED SAFETY FEATURE. We're known for precision design and manufacturing filters for custom application. We can design your custom filter.